I discovered the Tibetan people during a first trip to attend the celebrations of Losar, the Tibetan New Year. I felt directly in harmony with people, its culture, its fervor. Back in Brussels, I knew this trip would be the first of a history. My guide was called Pierre. He was physiotherapist and acupuncturist and lived with a Tibetan companion. Eight months later, he asked me to follow him on a humanitarian mission of acupuncture in remote villages of the Diqing region. Living in the home of the Tibetan doctor and sharing daily family while welcoming the many patients, it was a wonderful experience. In 2002, he returned to Belgium where he lives with his wife and 2 children. Several times I almost return to Tibet with them but every time something prevented. When he finally proposed to be part of a trip focused on Buddhism, I did not hesitate a moment. 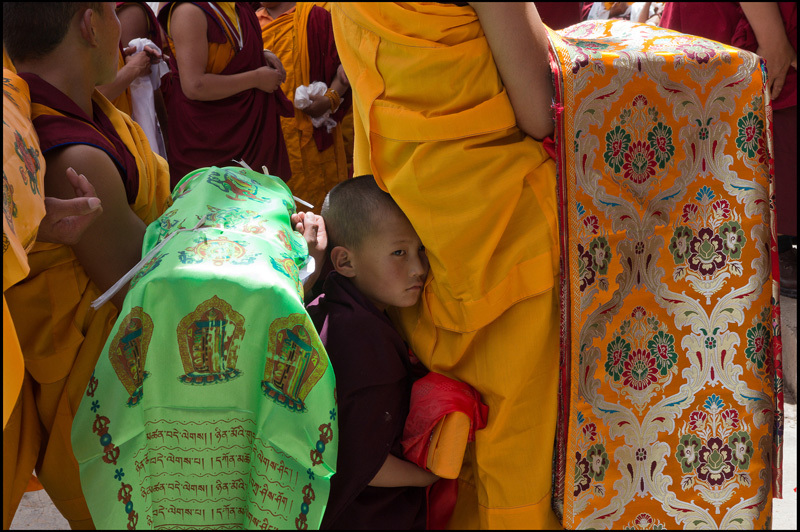 These photos are a selection of the privileged and intense journey from monastery to monastery in the historic part of Tibet from Sichuan région. After a career as a professional dancer, Sergine Laloux set her sights on photography. 1987 saw the birth of a long working relationship with choreographer Michèle Noiret. From 1989 onwards, following a workshop in China with Guy Le Querrec of the Magnum agency, she turned her attention to black and white reporting. In 1993, she received a prize from the Leica International Contest, entitled ‘The Fascination of black and white’ for her portfolio ‘Looking into Africa’ and was selected for the ‘Leica Magic Moments’ exhibition to celebrate 40 years of the Leica M.
In 1995, she took part in an exhibition shown at the Charleroi Museum of Photography called ‘The Three Great Egyptians’, the Giseh pyramids through the history of photography. In 1999, reports “The Fall of the Wall” and “The Wall, 10 years on…?” gave the exhibition “Berlin” created in Brussels. The disappearing rural way of life in the Alentejo region. The life of Alentejo’s tziganes. In 2001 a large-scale reporting assignment took her two time to Tibet where she followed the Losar Ceremony in Labrang Monastery and a humanitarian mission in the isolated villages of the Diqing region. In summer 2014, 13 years later she decided to return to that Tibetan culture she loved and traveling from monastery to monastery in the heart of Buddhism. Since 1991 she has taken part in a large number of personal and collective exhibitions, both in Brussels and abroad.